Technology has reshaped the way in which organisations run their business. Different technology has enabled organisations to streamline and improve various aspects of their operations and functions. Employees have also benefited massively, as they have been able to use technology to make processes within their job role easier and less time-consuming. Interested in modern work practices, training and qualification provider The Knowledge Academy analysed the latest findings from business software and services firm Advanced, who surveyed over 1,000 UK employees in professional occupations to discover the technology they would most like to see in their daily working life. The Knowledge Academy found that cloud services (35%), whereby users can remotely access software and applications stored on secure servers and networks managed by an external cloud computing host, as one of the two technology resources British employees would most like to use in their everyday working routine. The other technology highly desired by UK professionals is artificial intelligence (AI) at 35%. Perhaps unsurprising, as AI driven programmes have the capabilities to sift through huge amounts of information and data to harvest valuable insights in a much quicker and accurate manner compared to human efforts. Interestingly, 31% are keen to utilise predictive analytics techniques such as data mining and machine learning, to analyse historical information/data to predict what might happen in the future. For instance, individuals could apply the relevant principles and methods from predictive analytics to assess the varying impact each potential final Brexit deal could have on their organisations long-term success and sustainability. Contrastingly, augmented reality (AR) ranked as the least appealing technology – with only 17% of employees wanting to harness it in their job each day. Slightly above, 18% are happy for robots (i.e. configured software) to automate the tasks and responsibilities they believe are mundane (known as robotic process automation). Furthermore, the Knowledge Academy wanted to understand the actual influence workplace technology had on UK employee’s performance and satisfaction. To achieve this, the Knowledge Academy analysed findings from business-to-business (B2B) digital services provider Econocom. The biggest performance-related gain British workers think they will accomplish from having the latest technology (relevant to their organisations needs) is improved productivity (55%). Closely followed by greater flexibility (54%) and then, more mobility (32%). 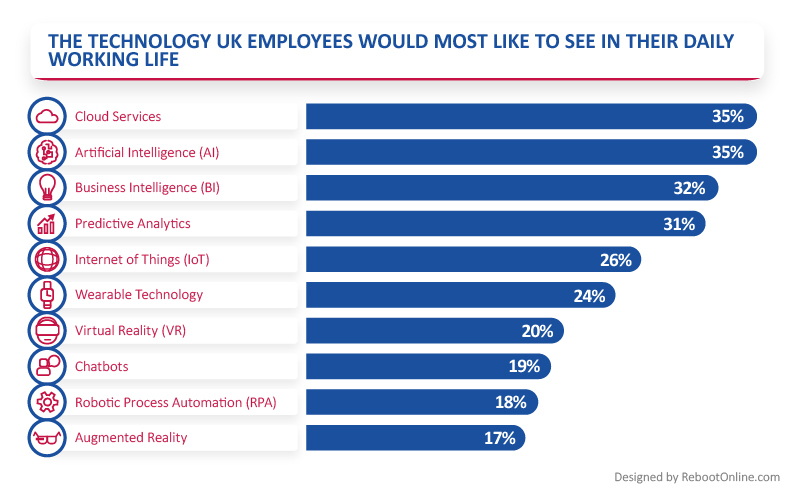 From the report by Advanced, the Knowledge Academy also illustrated some of the most notable opinions UK businesses and employees have on technology in the working environment. It is revealed that 65% of workers are willing to work alongside robotic technology, if it led to the reduction of manual processes. Additionally, 34% of British employees would consider a robot with the right business intelligence, to be better at decision making than their respective boss/bosses or senior management. 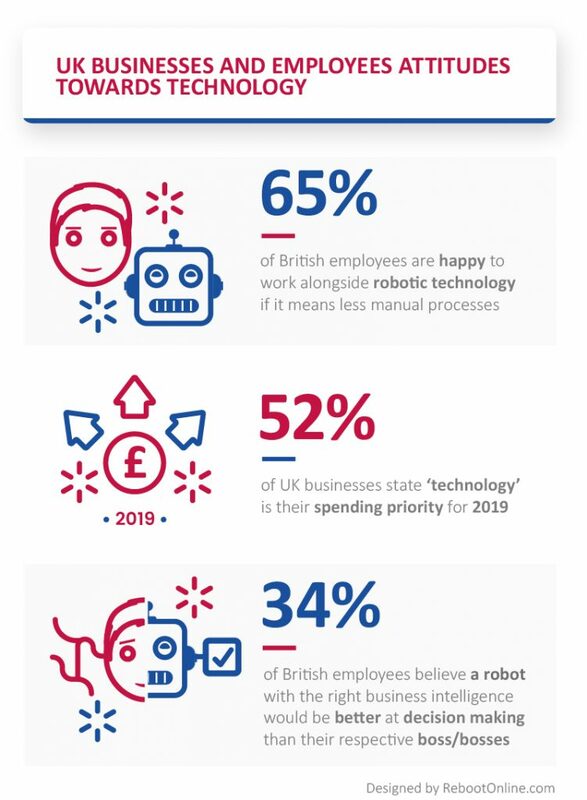 Looking forward, 52% of UK businesses have commendably made technology a spending priority in 2019. Joseph Scott, a spokesperson from the The Knowledge Academy comments, “Technology has become an integral part of the working world. It has allowed individuals to become more efficient in the way they conduct their professional tasks and responsibilities. As various technology develops, it will undoubtedly capture the attention of employees seeking to utilise the tools that will allow them to become more proficient at their job. This research certainly highlights the current technology which is creating the biggest impression on British employees to regularly assist them in their working life”.